Austin knew from pretty much the jump that he could be losing his returning starter at center. Decker announced in late May his decision to retire from football, citing a dwindling commitment to the game. While the outside braced for the loss of a true bright spot in a dismal 2017 season for offensive line play (only one Big Ten team averaged fewer rushing yards per play than the Huskers' 4.25 YPP and that was Illinois at 4.22), Austin wasn’t as worried internally as you'd think. For that reason, Austin feels good about his offensive linemen, and his centers, heading into the fall. When asked, generally, just how good he felt about the group, he offered perhaps the clearest answer on who’s leading the pack. The “who else” in this case is a foursome consisting of some veterans at other spots on the line and a pair of youngsters. The group everyone heard about during the spring: senior guards Tanner Farmer (right) and Jerald Foster (left) along with redshirt freshman Hunter Miller and true freshman Will Farniok. Austin said the staff also hasn’t yet closed the door on an “outside source” coming onto the team and contributing. He had no news of further roster attrition to share, at least in his room, so space for a newcomer would likely have to come from elsewhere. Until then, it looks like last year’s first starter at center might be the guy. Perhaps Austin was talking about Conrad again a little later when he offered pretty high praise for his group. Media interviews came first, before the main show started, but once Austin and Moos made their opening “here’s who I am, here’s how I got here, here’s what’s going to happen” statements, the questions came. One, directed at Austin, asked whether Nebraska has the talent it needs currently on its roster to rebuild The Pipeline. He said it’s his job to push those few to reach that potential. Can they be pushed? “Damn right,” Austin said. Maybe that was just playing to the crowd, but since they got here, this new coaching staff hasn’t really been the type to give off showy one-liners without substance. 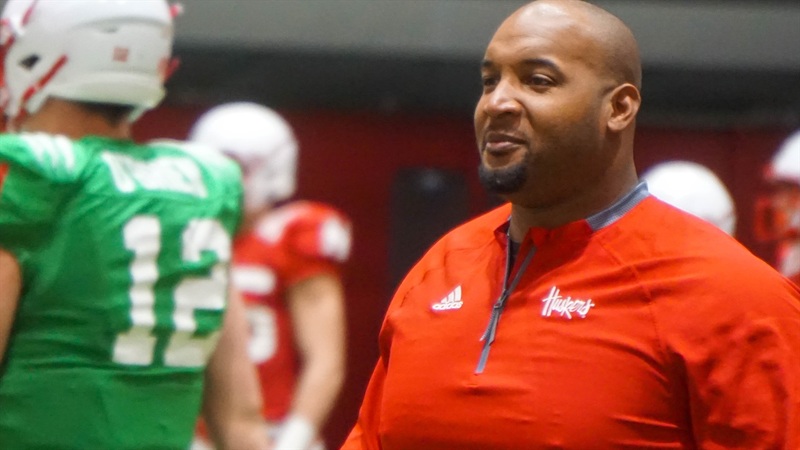 They haven’t had the chance to prove themselves on Tom Osborne Field yet, but they have the next best thing in a perfect 2017 season that validates the idea that what they do works. And they all seem pretty aware of the fact the people they’re speaking to have been fed false promises for the greater part of a decade.